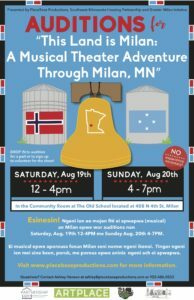 PlaceBase Productions performed its 9th full-length musical play in the community of Milan, MN. This town, which dates to the 1880s when the railroad came through this part of the state, has historically been known as a mecca for Norwegian culture. The Milan Folk Arts School is known worldwide for its classes and festivals surrounding spoon carving, silver smithing, weaving, and many other crafts. A thriving arts community has sprung up in and around Milan in the last thirty years, and at the same time, like most small towns, the economy and mainstreet have been significantly reduced. In the last ten years, however, young Micronesian residents have come to make up over 50% of the population of Milan, foretelling a future that is both bright and new. This Land is Milan involved over 40 local residents in the performance of local history, lore, and a few tall tales. When residents of Milan sat down together with our PlaceBase team the stories of Milan flowed like sweet honey from the rock of gibraltar. Now, we’ve got one more event before auditions for the play itself. Join the community of Milan in listening to and telling their own unique, historic, funny, moving, musical, dancical and ever-changing story. 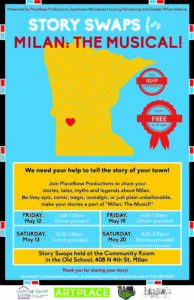 PlaceBase Productions, Greater Milan Initiative, Milan Teen Center and Southwest Minnesota Housing Partnership presented Music & Movies in Milan! 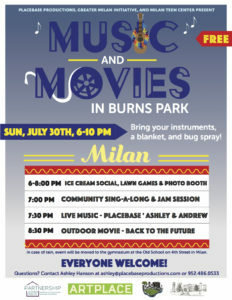 in Burns Park in Milan on Sunday, July 30 from 6-10pm. 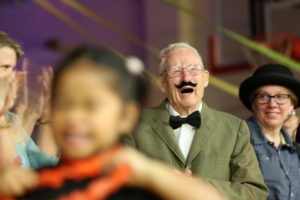 This free, family-friendly event included an ice cream social, lawn games, photo booth, community sing-a-long, jam session, live music and an outdoor screening of Back to the Future! People brought instruments, blankets and bug spray to Burns Park for a night of fun, music, and community! See full timeline of events below!